Sound and architecture have an ambiguous interaction in their relationship to an one another. Sound used to be one of the main criteria for constructions of buildings, such as churches and cathedrals. Complex construction where sound was a key element in the consideration of the structures design and indeed the sonic organization of a space would inspired the composition of that space. Today sound is the poor parent of the architectures dominated by visually based dictate of contemporary construction, as an added extra sound is often overlooked and thus a virtually non-existent feature of modern architecture. Artists, architects and theoreticians are increasingly beginning to address this deficit and have started to think about the relationship between Sound and Architecture as warranting a possible field of exploration in itself – as a medium such as sound perception or production – architectural deconstruction or understanding driven by its sonic and social interactions within a space. As an extension of the human habitat we see architecture from a personal space to a massive collective habitat or the human activity of building and by correlation as the urban construction or as public open architectures/public space. Thus, architecture is a place where the physical relation to walls and doors, roofs and windows are paramount, a place for the purpose of protection as control and punishment, a place for circulation and exchange, for streams of people imprinting their daily lives on an embodied enclosure. 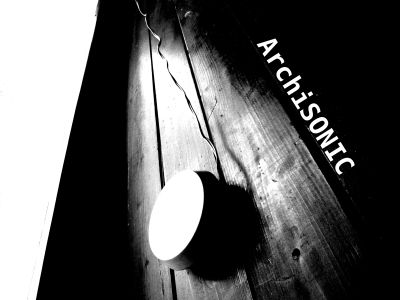 With ArchiSONIC we ask artist to address, extend and interrogate the question of sound and space. What is our experience of sound in the environment? How does this affect our perception of a space or sound? Can the mechanical processes of sound production reveal hidden structures within architectural space otherwise unobtainable to the perception of those that inhabit or traverse these buildings/spaces? Can we explain sound as a simple air and reflection phenomena extracted from the real by artistic gesture? How we create those process, how we revealed those phenomena?